Tomato hornworm are causing much damage to our tomato plants. It is best to simply remove them from the plant. If you see small white rice-like objects hanging from the beast, leave them alone. 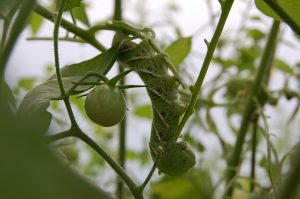 It is type of wasp egg that will hatch and kill the tomato hornworm. I was startled when I first discovered these monsters destroying my plants. But a quick search and a few discussions with some local old-timers put me at ease. Simply pull them off the plants and let them die from starvation. 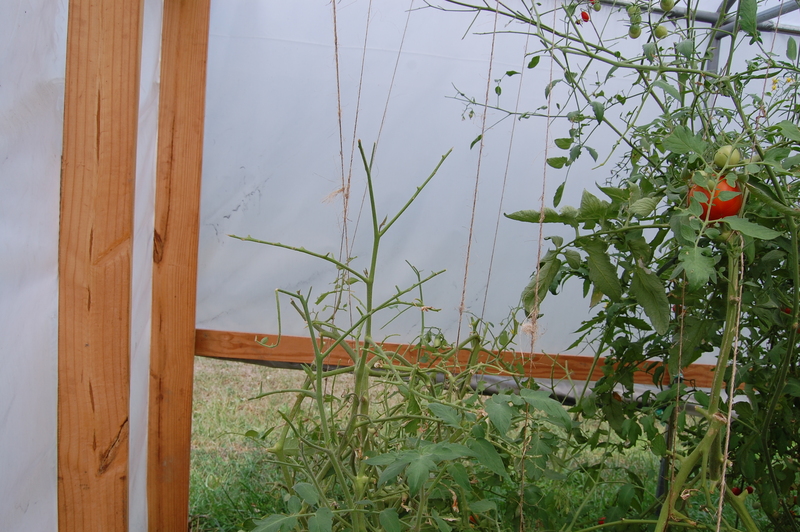 they can tear a tomato plant to shreds in a day or two if you let them. They can be hard to see on the plant as they are camouflaged but simply look for where there are many missing leaves on your plants. You will typically find one big one per plant. They grow large very quickly. You can see here the damage cause by the pest. If your plants are vibrant and you simply remove them, the plant will continue to do well and provide you with plenty of tomatoes. In the fall after I removed all the plants, I tilled the earth where my plants had been. They lay eggs in the ground which hatch and become a moth in the spring completing the life cycle. Removing any larvae you find in the ground will reduce the chance that your infestation will be bad the next year. We typically don’t plant tomatoes in the same area year-to-year. 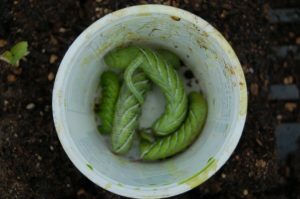 We hope this has been helpful to you in dealing with these types of pest in your garden. 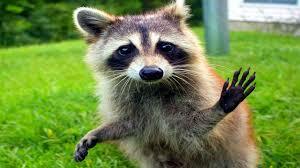 Leave a comment on you deal with these little pests and whether you have another way of getting rid of them. Making your own soil blocks can be a great money-saving idea. This is one of the busiest times of year at FiveDollarFarm. We are focusing on basic areas that will become habit once you start implementing them. One of these areas is planting your own seeds in soil for the plants that you want to grow. Whether those plants are part of a healthy diet or perennial plants or flowers for your landscape, you can save money by planting the seeds yourself. You could go down to the local “China mart” store and buy your standard run-of-the-mill seed starter trays and bag of starting soil. We have done that in the past but no longer. A few years ago we began saving our small plastic 8 ounce yogurt cups. These were great for us when we were just trying to feed our own family. We generally only planted about a dozen of each plant we wanted like cucumbers, tomatoes, and the like. I still use them. I am experimenting with seed germination rates or when I find some old seeds that I am not sure if they will germinate. Our goal has been to use what we have instead of buying everything we need. Reuse where you can to save some money and the planet. One new thing we have tried this year to take our sustainability to a new level is the soil block maker that we purchased from Johnny’s Selected Seeds. We actually bought two block makers and the plug attachment for the larger one but generally we are only using the larger one. 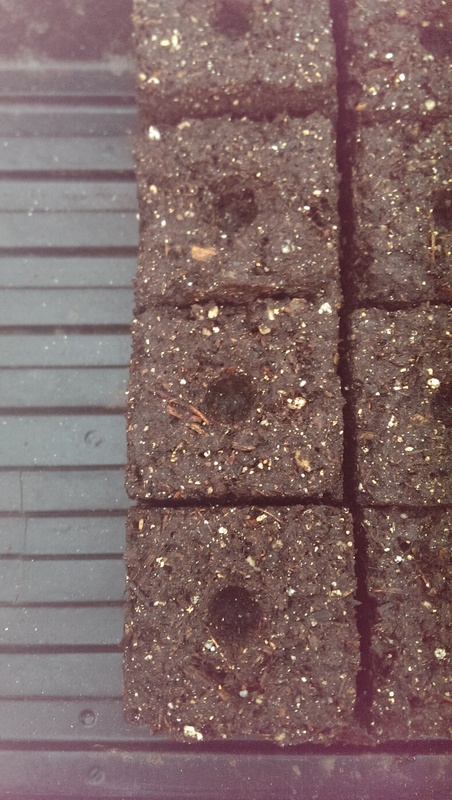 The basic idea for these is to mix up some good seed starting soil and use the block maker to compress the soil into its own container for seed planting. Brilliant! 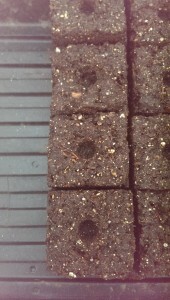 Also, 50 soil blocks fit perfectly into a 1020 flat tray which is a standard plant tray. 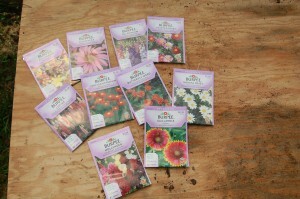 We also began using Johnny’s Selected Seeds almost exclusively for two important reasons. First, they offer most of their seeds in a pelleted version which I found works nicely with the soil blocks as you can drop one pelleted seed into the dimple. Secondly, I found that they generally have a higher germination rate that most other seed companies out there. Another mistake we had made in the past was to plant multiple items into the same tray. We didn’t know what some of them were when they began to germinate. That could be quite confusing. However, in the spirit of our own personal renaissance, we are challenging all rules that we know or were taught that limit our creativity or thinking. In this spirit, I will sometimes happily surprise myself by intentionally NOT labeling a tray to discover something incredibly delightful when it spouts. Seeds from Burpee found in the supermarket. This post has a video associated with it so you can see the soil block maker in action. If you have any questions about the block maker or suggestions that everyone can use please feel free to share them. All comments are welcome. Do we all seek a life well lived? An interesting thought occurred to me recently. 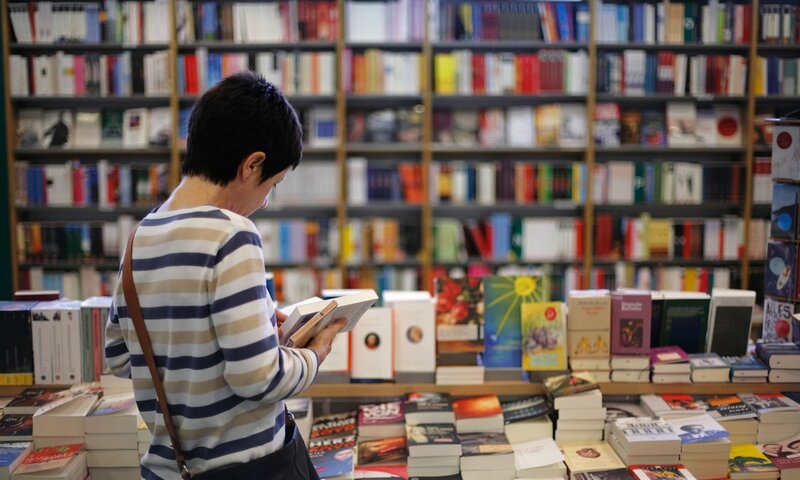 While travelling and stopping in a bookstore, I noticed near the entrance of the store a table of books that were obviously placed there to grab customers attention and hoped to be purchased. All the books related to health; eating, exercising, weight loss, etc. Why is this such a popular topic? An English high school teacher told me that books are written about subjects that are currently popular. There are books to chose from. I began to ponder why this was such a popular subject. Are Americans dissatisfied with their appearance or their weight, and their diets? I think they are. Our careers, marriages, families, and many other areas of our lives need so much help. How many people want to but never really live their lives the way that they desire to? Great changes can be made by merely making a decision to do so in the moment. This is our personal power. We all have a equal amount of it and no one has more than any other. Once a desire has been made the universe will conspire to make it happen. Why don’t more people know this? Sadness and disappointment follow many a man to the grave. FiveDollarFarm will explore these topics more in-depth in the coming months. Watch us strive to grow go food for local people. Others will learn to do the same by our teaching. We want everyone to have a healthy, wealthy, happy lifestyle. Stick with us as we get full swing into the spring season and begin eating in season foods. You won’t regret it. This past week was difficult as all but one of us was taken down by the flu. It was disappointing as the children were to sing on Easter Sunday morning service. They missed all the holy week practices. We regained our strength enough to have a quiet Easter weekend at home. We wanted to catch-up on some much needed spring farm work. One of those chores was to build the new brooder. I went to the local building supply store and purchased the materials I needed from the plan I devised. Much to my delight customers were hardly to be found. I also purchased additional lumber for the boxes that my honey wanted to use as raised beds. 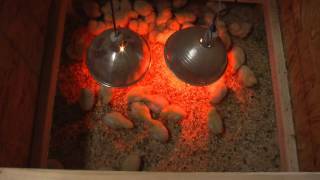 Building the Ohio brooder went much faster and smoother that I had imagined. I worked on the task joyously as I reflected on what specifically the meaning of the day was for me. Earlier my brother had stopped by to retrieve some items he left from a prior visit and our brief discussion involved some deep spiritual learning we had both undertaken. 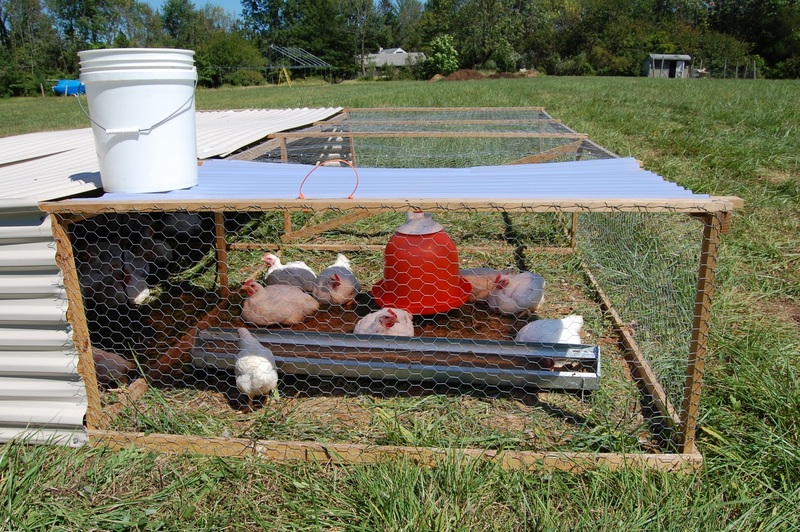 What Is an Ohio Chicken Brooder? So what is and Ohio Brooder? As any corporate senior director would respond, “That’s a very good question.” Searching on all the known sources does not reveal much information as to where the brooder originated by if I had to guess, I would say Ohio. I am now ready to be promoted in the corporate world to the highest level of my incompetence. Anyway, the basic idea of an Ohio Brooder is a box with four corner legs that keep it slightly off the ground so that chicks can run underneath and gain access to the heat source inside the box. The heat source is usually a brooding lamp with the heat being retained inside the box. I built mine with some hinges to access the inside of the box for cleaning and light bulb changes if necessary. Nothing fancy, just need to have a place where the chicks can stay warm. The idea is self-regulating. they run outside to get food and water and run back under the box to keep warm. And that’s it. With our production schedule of meat birds this season, I may build another one just like it but need to decide where to place it as a draft free area is hard to find for us right now. The one recently build is inside the garage. So until next time, do something for your farm or farm business everyday. 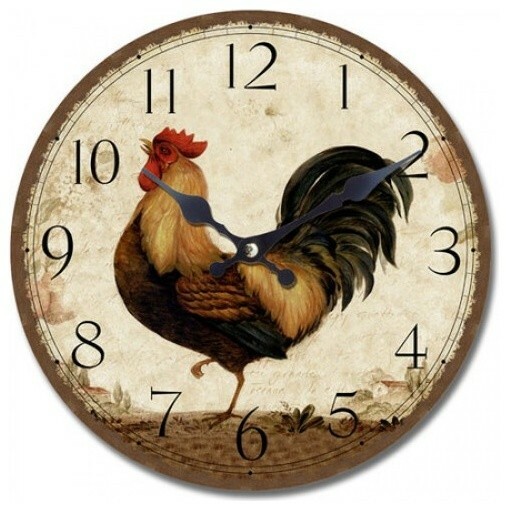 One of the biggest problems that we are dealing with on FiveDollarFarm right now is time management. There is just so much to do that on some mornings after not having enough coffee we can seem lost. This is exacerbated by the fact that we still work off farm in an operational position where planning is difficult due to constantly fighting fires. Our primary short-term goal is to leave the off-farm job. We hope to generate enough income from the farm to live a happy and healthy lifestyle. Yet still we find a limit to our joyful tasks with the ones that may not yet have become so joyful. How do we deal with these? We have gone back to the basics and utilized the list of to do’s. This time we have broken them down into three categories: short-term, mid-term, and long-term tasks. This has seemed to work rather well for us. We have set aside a time to discuss what should be included in the two latter categories while the short-term list is my daily direction to get to the mid and long-term task completions. Building on a small success as crossing an item off the list helps to build on future successes. This keeps us motivated to move forward with our plans and where we want to go. One particular difficulty this can bring especially in our situation is the dependency of tasks to be completed. For example, I need to prepare the seed starting area in the greenhouse. The water system is not yet fully installed. Sometimes larger projects are forestalled by the amount of time available needed to complete them, the material resources necessary and available, or the prerequisites for that particular task. This problem is solved by breaking larger projects down into smaller tasks to be accomplished. For instance, all materials for the water systems project have now been purchased. They are available when the time comes to complete that job. Before we know it, the water system is ready and then the next task in line is completed. Remember every now and then that it is a good idea to review previous lists of tasks. Take note of how well you did in completing them. Make notes of improvements that can be made the next time a similar task is attempted. Success builds upon itself. Let us know your time management strategies. The picture below shows a Google Image search on the phrase “solar energy”. As I have been saying, this is disconcerting to me because solar energy is so misunderstood. Humans have a tendency to tear things apart and put them into pieces while ignoring the whole from a distance. We need to have a “bigger picture” mentality in my humble but accurate opinion. 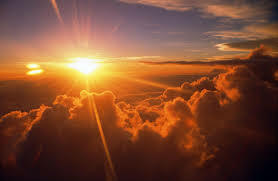 Take a step back and think about solar energy from a different perspective. I have the idea in my mind that the idea should include sustainable agriculture. 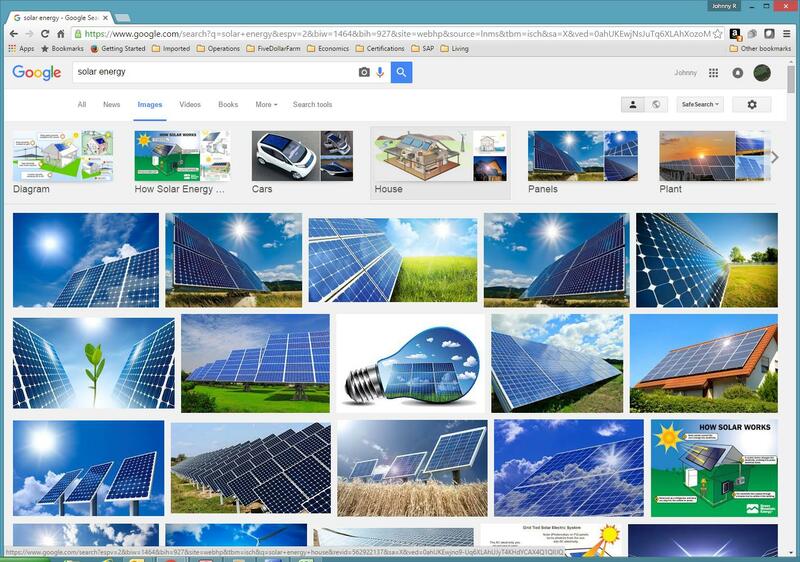 When searching Google Images these images show the major misconception of solar energy. Why sustainable agriculture? Because sustainable agriculture is the bigger picture that we need to better utilize solar energy. On a small piece of land solar energy is collected in the open fields and produces grass. But when we include cattle that are grazed with intensive management techniques followed closely behind by chicken tractors containing meat birds and free range poultry, something new begins to happen. The bigger picture becomes more clear. Our food is better as well as more healthy. We can make better hay to feed the cattle in the winter. The cattle manure makes the grass better. The cycle will never cease unless we disrupt it somehow and for some reason. 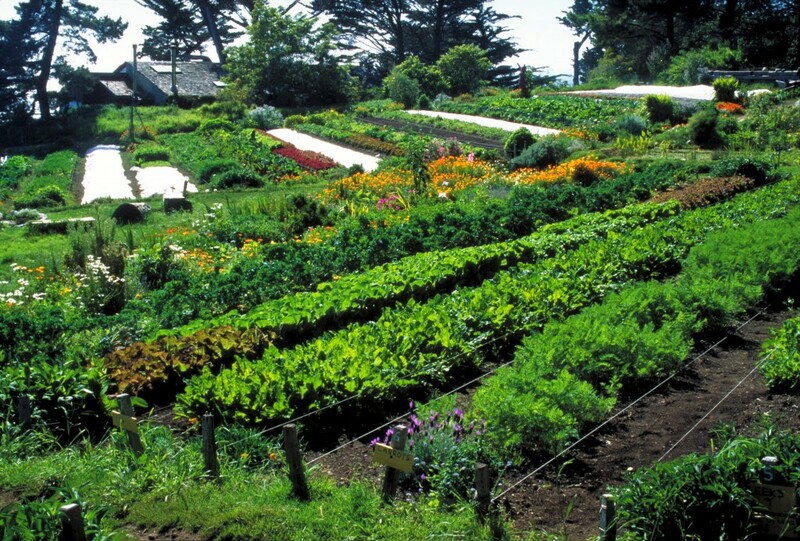 We can quickly take a small piece of land and make it more productive, more profitable, full of health, and at the same time use it to feed many people. 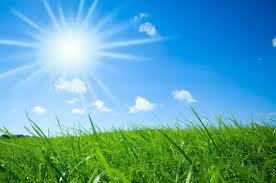 The grass stores our solar energy. Other problems can quickly be solved as well. We are removing confinement operations that have a tendency to concentrate illness that puts a food source at risk. If we also keep the production and consumption local as well, we eliminate the fuel used to transport our food across the country as it is now. Many are starting to realize that our food system is broken. They are searching for some other alternatives and as farmers it is our responsibility to give them better choices. We can store solar energy and create better food at the same time. Learning to make a system work as a whole as opposed to tearing it apart and utilizing one part or only a few is counterproductive. What do we do now? We educate others that solar energy is not just putting up a panel and using about twenty per cent of what we collect as a convenience or a conversation piece to establish our nobility as good earth citizens. Going further can also mean eating locally grown and produced food, supporting local farmers markets, and being responsible with your own personal choices. This will not happen overnight but it is happening at a faster pace as we look around. People are demanding more options and making better choices. When that happens, we all win. This garden collects about 5 times more solar energy than a solar panel ever could. 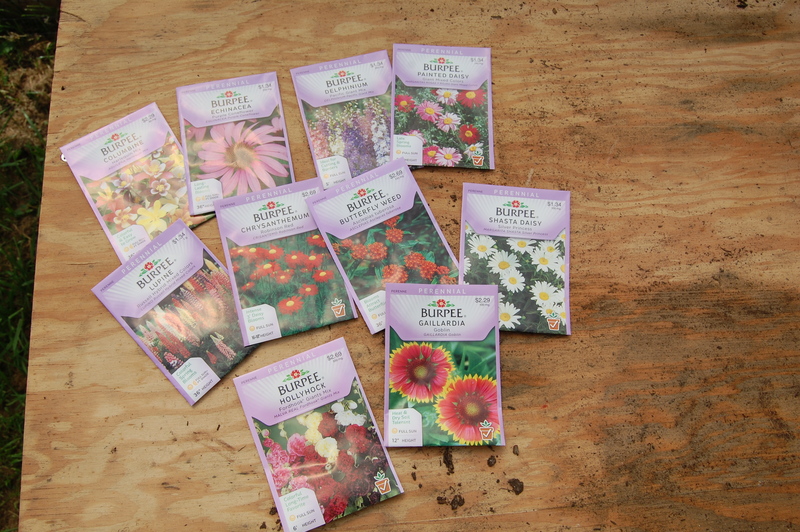 It’s that time of year when I can barely contain my enthusiasm over the coming spring. Not to mention the fact that it is tax refund time and bonus time while I still work off the farm. However, the seed catalogs have been filling the mailbox for sometime now and I have perused the best websites for my seed selection. I have already ordered some and germinated some of my earlier crops (brassicas) such as cabbage, spinach, some lettuce, broccoli, and herbs. 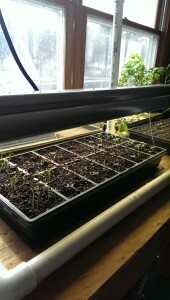 The seed starting trays are on a heating mat to provide the correct temperature for germination. 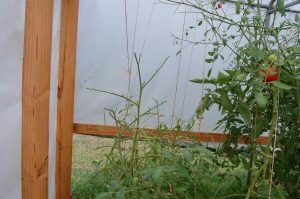 I also have used a newer method ( new for me) in the greenhouse where I created a containment area with old unwanted hay bales and filled it with horse manure. I then built a simple table frame with furring strips across the top to hold 1020 flats that have mostly soil blocks in them. The table is covered by plastic which is supported by pvc hoops. The heat contained within provides the temperature for seed germination. How exciting. I used this idea after watching a YouTube video of “Muddy Fingers Farm” in New York. I believe there location is colder than mine here in Pennsylvania. Now that the table is built in the greenhouse, this weekend will be consumed by soil preparation and soil block making to fill the table with the goodies that all the locals crave after a winter such as ours. 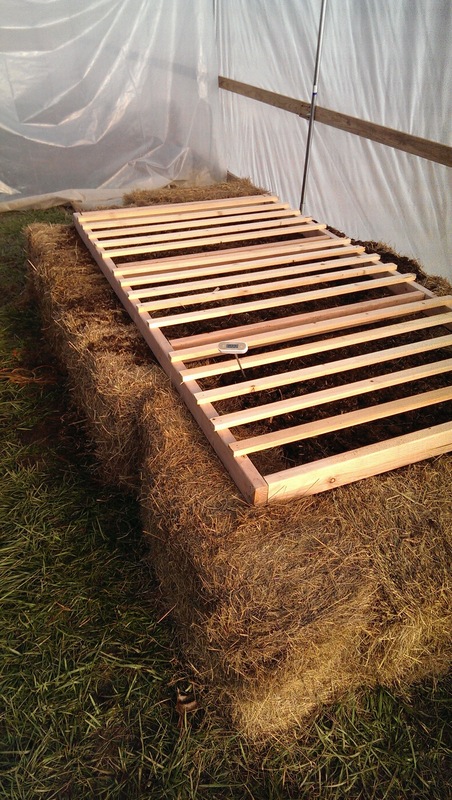 Filled with fresh horse manure, the table uses composting heat to aid in seed germination. This year we are using the soil block maker purchased from Johnny’s Selected Seeds. The first time I used this I failed horribly and was discouraged. But my second attempt after correcting for soil moisture content and screening my materials yielded very nice and uniform blocks. My mixture consists of well composted horse manure, decomposed double-ground hardwood bark mulch, perlite, and a touch of vermicompost. The ratios are not necessarily important so don’t get hung up on them. You’ll know a good soil when it’s in your hands and if you don’t, keep trying until you do. Make sure you have plenty of moisture so the blocks will form. I bought two different sizes, 2 inch square and the 3/4 inch. I also bought the dimple kit for the 2 inch square. This makes a cube in the top instead of the dimple so that the smaller block can be “transplanted” into a larger block when the time comes. Brilliant! 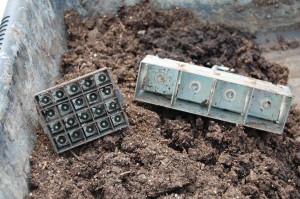 These soil blocks are handy to make and use and 50 fit nicely into a 1020 flat. If you try any of these ideas let me know if you were successful. Have a great spring. Just go out and plant something and play in the dirt. It’s good for your soul.